New research from Israel shows the promise of using artificial intelligence as a second set of eyes to spot osteoporotic fractures and coronary vascular events. 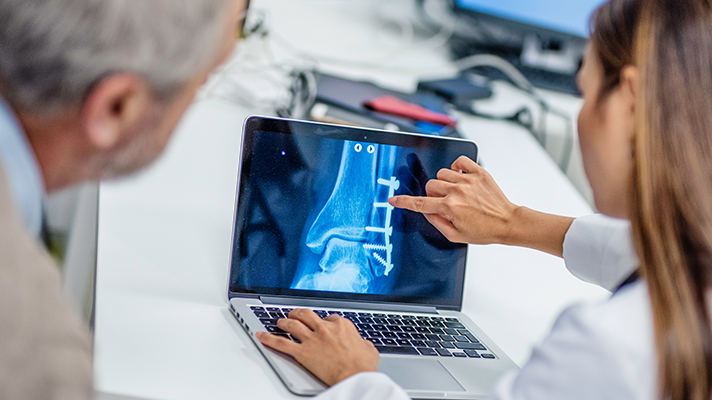 Israeli healthcare system Calit Health System teamed with analytics company Zebra Medical Vision to develop ways artificial intelligence could be leveraged to help predict two major under-diagnosed medical conditions: osteoporotic fractures and coronary vascular events. Using CT scan data, the AI tools showed improvements in predicting instances of both. In each case, when AI was paired with existing predictive and diagnostic measures it was able to improve both the "sensitivity and specificity" of the clinical predictions, leading to much better predictions of future health events, said Calit Health and Zebra Medical officials. In the instance of cardiovascular CT scan data the companies reported a "net 4.5 percent categorical risk-reclassification improvement." With osteoporotic fractures, the use of an AI-derived risk score led to better results than those of existing predictive measures, they said. CT scan data is already captured but has not always been put to use in predicting other medical events, researchers point out. This study found that only 20 percent of those at risk for osteoporotic fractures undergo any screening, but that 66 percent undergo CT scans for other reasons. The cardiovascular AI "pertains to all studies which are performed on a routine basis involving the chest CT," the study notes, meaning that there is a wide range of data ripe for predictive analytics. Osteoporotic fractures and cardiovascular health are some of the costliest areas of American healthcare. The price tag of fractures comes to $18 billion per year, and heart health costs the nation a half billion a year currently and is expected to double in the next 20 years. More generally, AI technology is increasingly being developed as a "second set of eyes" in screening for and predicting ailments. The tools are also serving to augment non-specialist medical practitioners, who may be eventually able to administer some specialized tests in a primary care setting instead of a more invasive exam. Overall, AI is helping researchers pinpoint and understand small changes that even a trained eye can occasionally miss. As a wide range of medical images are paired with predictive analytics, the hope is that more easily preventable medical conditions can be averted entirely, or at least before they become serious and costly. "We are pleased with the results of these two groundbreaking research projects and are looking forward to getting them into practice," said Ran Balicer, head of Clalit's Research Institute. "While there is an increasing number of AI applications in imaging, aiming to mimic and automate human radiologist' reading, there is larger untapped potential in these imaging studies – one can use AI to extract predictive insights unavailable to date, that support high-impact population health interventions to tackle chronic diseases."